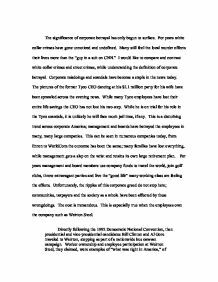 Compare and contrast white collar crimes and street crimes, while understanding the definition of corporate betrayal. The significance of corporate betrayal has only begun to surface. For years white collar crimes have gone unnoticed and undefined. Many still feel the local murder effects their lives more than the "guy in a suit on CNN." I would like to compare and contrast white collar crimes and street crimes, while understanding the definition of corporate betrayal. Corporate misdoings and scandals have become a staple in the news today. The pictures of the former Tyco CEO dancing at his $2.1 million party for his wife have been sprawled across the evening news. While many Tyco employees have lost their entire life savings the CEO has not lost his two-step. While he is on trial for his role in the Tyco scandals, it is unlikely he will face much jail time, if any. This is a disturbing trend across corporate America; management and boards have betrayed the employees in many, many large companies. This can be seen in numerous companies today, from Enron to WorldCom the outcome has been the same; many families have lost everything, while management gets a slap on the wrist and retains its own large retirement plan. For years management and board members use company funds to travel the world, join golf clubs, throw extravagant parties and live the "good life" many working class are feeling the effects. Unfortunately, the ripples of this corporate greed do not stop here; communities, taxpayers and the society as a whole have been affected by these wrongdoings. The cost is tremendous. This is especially true when the employees own the company such as Weirton Steel. Directly following the 1992 Democratic National Convention, then presidential and vice-presidential candidates Bill Clinton and Al Gore traveled to Weirton, stopping as part of a nationwide bus caravan campaign. Worker ownership and employee participation at Weirton Steel, they claimed, were examples of "what was right in America," of what worked, the future of American industry. ...read more. These street crimes lead to the downward spiral of society economically and morally. Another aspect of how street crime ruins society is that the act is usually committed within the society itself. Most street crimes are committed by deviants to the members of their own neighborhoods. This is due to the closeness of their potential victims. This is why neighborhoods which characteristically generate the cause of deviant behavior generally have a higher rate of crime occurring within them. While all crimes are a wrong committed against society, some do more damage to society then others. Street crimes are perhaps the most harmful to society, caused by the deviant criminal behavior on ones own neighborhood, this causes its destruction. Street crime has caused the legal economical, educational and moral declines in many neighborhoods. Violent street crime is not only a wrong against an individual of society but an act in the crumbling of society itself. While it is important to understand the extremely local toll street crime causes, let us examine the affects corporate crimes have on a community, specifically Weirton. Before the development of Weirton Steel as an ESOP, the community was faced with potentially huge layoffs and the possibility of complete demise of a town. The town thrived on its steel production; steel production was the heartbeat of the town. After the employees agreed to a 20% pay cut, appointed board members and elected a new union leader, the town viewed this as a positive step. Still, years later, is the community in better shape than it was 15 years ago? The significant effect white collar crime has on a community can not be identified as easily as street crimes. The problems are more deeply rooted than that of a simple assault; this is especially true for an ESOP. While Arthur Anderson looked the other way, board members and management was using company funds for personal gain. ...read more. Capitalism has proved to be the strongest economic system in the world; however it does not come without cost. The costs for corporate America seem fairly clear. From the arguments listed above, and more specifically the Weirton Steel example, it is apparent who the losers are...the working class. Our society continues to struggle with separation of class, and the result is nothing less than astounding. While corporate America labors with its new identity in the 21st century, the employees can only watch, wait and wonder; wonder what will become of a destroyed wealth. While our society seems focused upon localized crime, the leaders of major corporations are stealing the wealth of employees and gambling with the stabilization of a complete economic system. It seems only fitting that one of these leaders continues to profit from misconduct. Phillip Smith has named names; he has put his neck out; but for what? Has Mr. Smith offered any of the profits from his book to go to the people whom he help persecute? Has Mr. Smith offered suggestions on how things can change; or has he merely produced this book for personal gain? He does come out of the Weirton Steel saga looking better than most. It needs to be accepted that Phillip Smith played a large roll in the downfall, perhaps not as much as other actors, yet a roll nonetheless. Mr. Smith, after leaving Weirton Steel, continues to profit from the transgression that took place at Weirton Steel. Corporate America can only hope that other CEO's and board members of corporations accused of wrongdoing can profit from unscrupulous behavior. I wonder when Kenneth Lay's book will be out. 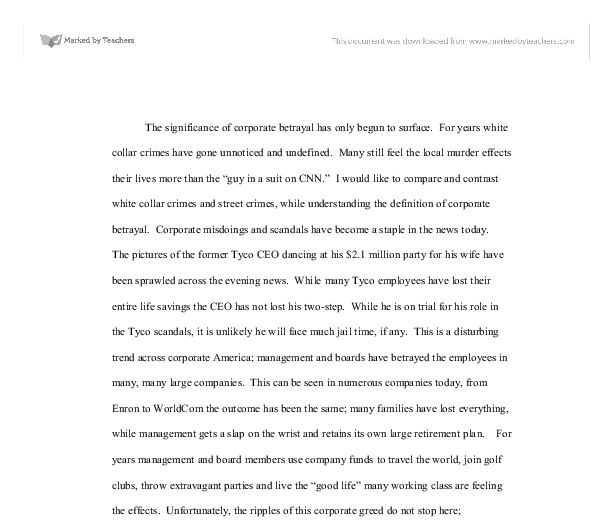 Here's a good title for a book: "How Tyco Robbed Kids so it's CEO Could Own His Very Own Jet." What do you think? Word Count: 3,363 1 Varano, Charles. Forced Choices: Class, Community, and Worker Ownership. ...read more. The homosexual, for example, who can not control himself and thus should not serve in the armed forces. (Smart,2002.P:81) A prime example of how power produces something other than 'docile bodies' is the prison system. This argument of sympathetic white bourgeoisie still demonstrating racial discrimination is also evident in Hughes' story "The Blues I'm Playing." The rich, classic art fanatic Mrs. Ellsworth pursues Oceola, an exceptionally talented black pianist. Mrs. Ellsworth desires to fund Oceola's study and stardom to fame, but she also desires to control every aspect of Oceola's life, even her home situation. beard, and powerful presence, at no time during either film is it suggested that he is responsible for the disaster. In 'Titanic' at the beginning he is shown as a dream maker and when the ship is sinking he is portrayed as lost and not in control. In liberalism feminism, prostitution is conceived of in the contractrarian sense of being a private business transaction. The liberal contends that a woman is free to enter into contracts. Liberal feminist believe that personal "rights" should predominate over concerns for the social good. One is that it is a natural part of the journey from childhood to adulthood. Youth group together for support into groups that function as half-way houses between the world of being a child and the world of being an adult. The family was seen as a refuge, a 'haven in a heartless world.' Coote, Harman, & Hewitt (1994) The above text suggests that wider social processes exercise influence on family forms and patterns. From the 1960's onwards a large amount of literature in support of women's liberation came from the presses.